Executive Branch Branch of government that enforces, or carries out the law. Judicial Branch Branch of government in which courts decide legal cases and interpret laws. Legislative Branch Branch of government that makes the laws. Checks and Balances Governmental arrangement made by which each government has the power to check, or restrict, the power of the other branches. Republicanism Government in which authority comes from the people and power is exercised by elected officials according to a set of laws. 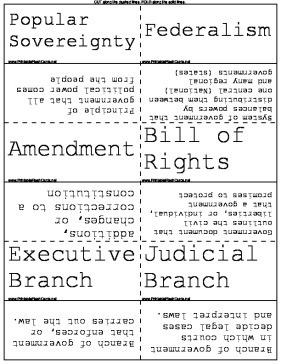 Separation of Powers Principle of government in which powers are divided among different government branches. Limited Government Principle of government in which power is limited by set laws, such as those in a constitution.